Muncie PTO and Pumps. Stocking the complete line of Muncie power take off models. Download parts breakdowns and parts lists in PDF format (above) to assist you if you need parts to repair or rebuild them. Muncie is the leader in Power Take-Off (P.T.O.) and hydraulic pump products for the truck and industrial markets. Muncie P.T.O.s are designed with a wide range of speeds and output options to work with all types of hydraulic pumps and shaft driven equipment of all kinds. We offer the complete line of Muncie PTO models, hydraulic pumps and repair parts, including: 6, 8, 10-Bolt and belt driven pumps. 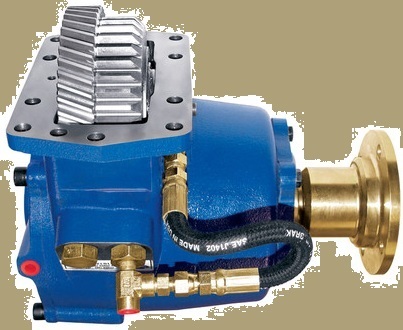 Direct mount pump and shaft driven options for cranes, man-lifts, blowers, water trucks, product pumps and generators are a few examples of whats available for your application.